1964 CHEVROLET CORVETTE COUPE FOR SALE. VERY CLEAN CAR. MATCHING NUMBERS! VERY DESIRABLE 327CI ENGINE WITH 365 HORSEPOWER! SOLID LIFTERS! 4 SPEED! OWNED BY THE PREVIOUS OWNER FOR THE LAST 32 YEARS! 74,800 ORIGINAL MILES! NEVER WRECKED OR RACED! PREVIOUS OWNER PURCHASED THIS VETTE 1983 AND AT THAT POINT BEGAN A TWO YEAR RESTORATION. THIS WAS A FRAME OFF RESTORATION WITH EVERY PART COMPLETELY RESTORED. COMPLETE ENGINE, TRANSMISSION, AND REAR END REBUILD. AS WELL AS A NEW CLUTCH, NEW HOLLEY 650 CARB, WATER PUMP, AND DUAL POINT DISTRIBUTOR. ALL GASKETS, RUBBER MOUNTS AND HOSES WERE REPLACED AS WELL AS NEW ELECTRIC HEADLIGHT MOTORS. ALL NUTS AND BOLTS HAVE THE CORRECT MARKINGS ON THEM. A COMPLETE NEW INTERIOR WAS INSTALLED TO FACTORY CORRECT SPECS. ALL DOOR HINGES, HOOD PINS, AND HOOD HINGES ARE CADMIUM PLATED JUST LIKE THEY DID IN 1964. 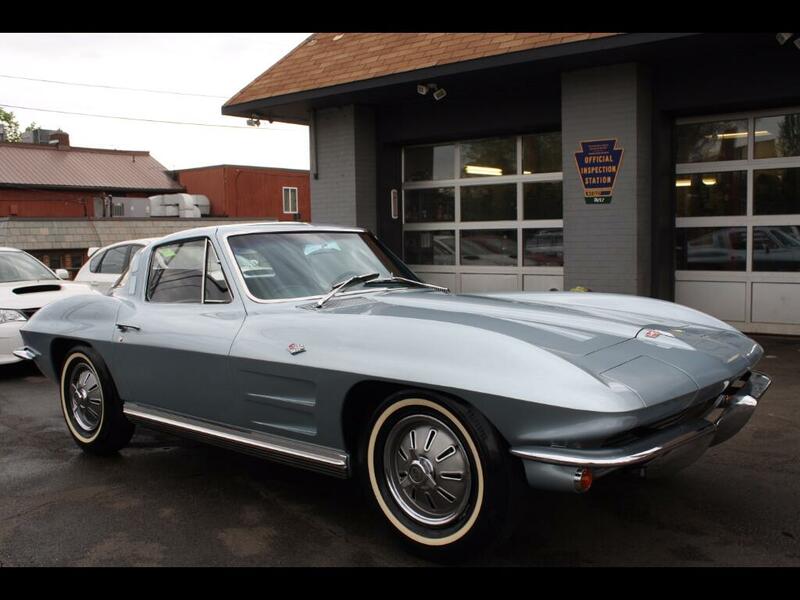 THE PAINT COLOR WAS CHANGED ON THIS VETTE TO ANOTHER ORIGINAL 1964 GM COLOR SILVER BLUE. THE ORIGINAL COLOR WAS SADDLE TAN. ALL PAINT WORK DONE TO GM STANDARDS WITH GM PAINT ONE COAT OF PRIMER, TWO COATS OF SILVER BLUE, THEN TWO COATS OF CLEAR. THIS RESTORATION WAS DONE RIGHT AND IT SHOWS THE CAR IS VERY CLEAN INSIDE AND OUT AND THE ENGINE RUNS FANTASTIC! STARTS RIGHT UP EVERY TIME! PLEASE CALL 412-366-7400 FOR MORE INFO OR TO SCHEDULE A APPOINTMENT TO SEE THIS VEHICLE. TO VIEW THE MOS PICTURES PLEASE GO TO OUR WEBSITE WWW.LWAUTOMOTIVE.COM. THANKS FOR LOOKING!